The Bluesky Nails brand are a hard wearing, full range of gel colour shellac style nail polishes which include various textures, glitters, color changing, neon and classic ranges. Bluesky shellac style gel nail polishes have become highly popular in the last few years as they can last up to 14 days without chipping or fading when applied properly. The Bluesky shellac style Gel Polish ranges need to be applied using a 35 Watt UV nail polish lamp to cure the nail polish gel and get the full shellac type effect. 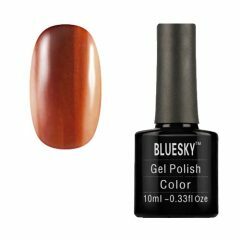 For optimum results it is recommended to use the Bluesky Nails base coat, and also the Bluesky Nails top coat alongside the Bluesky gel polish shellac style color you choose. Bluesky Shellac Gel nail polish is manufactured under strict conditions and all colors are European and British safety standards approved.